Degree in Medicine: 1977 Faculty of Medicine of the University of Barcelona. 13 with distinction, 5 outstanding and 2 passes. Degree standing: outstanding. Director of 34 Doctoral Theses (PhD programmes). National and international physician of reference in 1-Respiratory infections (pneumonia, COPD, bronchiectasis and immunosuppressed patients). 2-Invasive and non-invasive mechanical ventilation, and 3-acute respiratory distress syndrome. Research fellowship: 1987-1988. Department of Anesthesia of the Massachusetts General Hospital of Boston (Harvard Medical University) USA. Edward Shanoff Award. 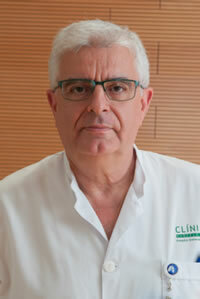 Associated Editor of: European Respiratory Journal, Thorax, Intensive Care Med and BMC infectious Diseases. Josep Trueta Award 2001 of the Academy of Medical Sciences of Catalonia and the Balearic Islands. Award of the Foundation of Healthcare Sciences 2001 to the 10 best biomedical investigators in the last 4 years. Lilly Foundation’s award 2007 in Biomedical and clinical research.